Rocks are not just missing chances. They're sitters. And it has to stop. 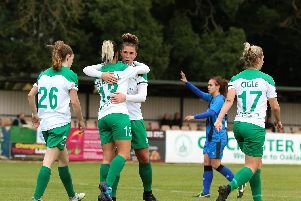 Bognor’s bosses reflected on two defeats in four days - and insisted their squad was talented enough to turn it around. The Rocks failed to score in losing at Walton Casuals in the FA Trophy and at home to Corinthian Casuals in the Bostik premier - but are drawing hope from two things. One is the way they played in the first half against Corinthian Casuals, when they produced some of their best football of the season but failed to find the net. The other is the imminent return to the Bognor frontline of Pompey loan striker Dan Smith, seen as their big hope of solving their recent goal shortage. The 2-0 Trophy defeat, which some fans said was the worst Rocks display in a long time, has cost the club the chance of thousands of pounds of prize money while the 1-0 reverse to Corinthinan, sealed by an 87th minute goal by the visitors, has left Bognor seventh, though only seven points behind leaders Dorking. Tuesday night’s league tussle saw two more Pompey teenagers introduced to the squad and wideman Leon Maloney and midfielder Freddie Read both shone. The Rocks now have five borrowed Blues youngsters – with striker Brad Lethbridge and defender Joe Dandy also on board – and are waiting to see how many will be available to them at any one time. Lethbridge started for Pompey in their 3-2 Checkatrade Trophy win over Sours under-21s at Fratton Park while Smith was an unused sub. Bognor hope to have both back for Saturday’s vital home clash with Wingate and Finchley. Pearce said he hoped defeats like the one to Corinthian Casuals would make them stronger. “I’m obviously very disappointed with the result but as for the performance, especially in the first half, if my team could play like that every week, and create that number of chances, I’d be absolutely delighted. But football is a game where the result is everything and it’s about putting that ball in that net. “At the moment it doesn’t seem to matter who I change, who I bring in, whenever they get in those areas, they don’t score. “But I was absolutely delighted with our first-half performance. They responded ever so well (following the loss at Walton). All you can do is prepare the players to play the game in an exciting way and create chances. If you do that enough, you hope over a period of time that you will get the right results. “They (Corinthian) were praying for half-time and we didn’t really want half-time to come. In the second half I didn’t think we played so well but we still dominated the game, we still got into quite good areas to score and it didn’t happen. “You’re always thinking then ‘is it going to be one of those nights?’ I said to Robbie then that I’d be happy to get out with a 0-0. “By the time they had their chances the game should have been out of sight. If it had been a boxing match it would have been stopped on points. It’s a hard blow for us to take. But hopefully it will make us stronger. “We are a young team – the left back is 17, left sided centre half 18, the others 21, 21, 26, 17, 23, 22, 17, 17 and 22. It’s a very young team and full credit to them. Pearce revealed centre-half Keaton Wood had a broken bone in his foot and would be out at least until Christmas. Wood and fellow central defender Corey Heath have both been out for several weeks, forcing midfielder Tommy Block to fill in at the back. Coach Blake cut a frustrated figure after Corinthian left the Rocks with a second league defeat of the season and said: “Things are not going at the minute. “I thought it was one of the best performances of the season first half. Second half, did we do enough? Probably not but I still didn’t think we were going to concede. We still have that little bit of naivety, a lack of leadership just to see it out. “The way things are going at the minute, when we look like we have got a little bit of ascendancy... boom, we’re back on our backsides. “Hopefully the supporters will look at that game and see what we’ve seen. We’ve played some very good football. No one tries to miss chances but for me these are not chances - they are sitters. We’ve got to score them. If you’re a No9 or 10 or 11 for Bognor, you’ve got to score them. People miss chances but these are clear-cut sitters. “Our game rises once we score – you get a monkey off your back and then you go on. But football’s got a habit of, when you’re down, kicking you even further. And it’s how you respond as a player and a group. Because I want to respond – I want to do well here. Blake said Read and Maloney were ‘really good additions’. He added: “Hopefully we’ve got Brad and Smudger (Dan Smith) coming back Saturday, and that will be a massive, massive plus for us, but we’ll have to see with the loan system who we will have. It’s good that Portsmouth allow us to have them and see how we try to play. Blake said the message to the team ahead of the next game would be to keep playing as they played in the first half versus Corinthian, but with a goal or two added to the mix. “Everyone’s seen that first half and we’ve just got to keep doing that and the tide will turn, and we’ll start beating teams again and we’ll climb the league,” he said.